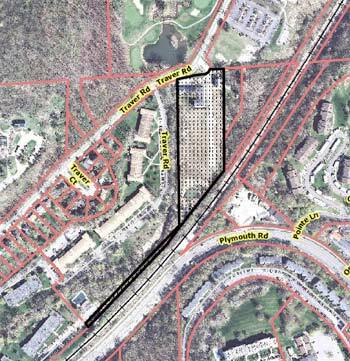 A proposal to build 19 single-family houses on a 4.6-acre site on Hideaway Lane off Traver Road – near the city’s Leslie Park Golf Course – has been approved by the Ann Arbor city council. The planning commission had recommended approval of the plan at its March 19, 2013 meeting. The council’s action came on May 13 at a meeting that had started on May 6. Aerial map showing the location of the Hideaway Lane project. Action on the planned project’s site plan and development agreement had been postponed at the planning commission’s Feb. 5, 2013 meeting. At that time, the city’s planning staff had cited the need to resolve several outstanding issues, such as determining the project’s impact on the property’s natural feature and mitigation requirements. Traver Creek runs along the site’s western border. Also needed was preliminary approval from the Washtenaw County water resources commissioner. On Feb. 5 the vote to postpone was 5-3, with dissent from Bonnie Bona, Kirk Westphal and Diane Giannola. The item came up late in the Feb. 5 meeting – after 11 p.m., following a long discussion and public hearing on the controversial 413 E. Huron project. At the commission’s March 19 meeting, the recommendation from staff was to approve the project’s site plan and development agreement, which the commission did unanimously. In separate votes, commissioners also: (1) authorized the project’s anticipated disturbance of the natural features open space, and (2) recommended approval of an alternative mitigation plan for the site. The project is located on the site of a development that began in 2005 but was never completed – and the site plan for that earlier development had expired. Currently, there are nine townhomes and one single-family home on the property, as well as infrastructure for additional development. The site is zoned R4A (multi-family dwelling district). The proposed new homes would all be two stories with either two or three bedrooms. The planned project proposal calls for spacing the houses 10 feet apart. Because the city’s zoning ordinance requires a minimum building spacing of 20 feet, the spacing modifications allowed under a planned project are being requested. The developer is listed as Trowbridge Homes of Hideaway LLC of Auburn Hills, Mich.